The temperatures had abated somewhat when we rolled out this morning. The first part of the ride was delightful along the American River Parkway which is a 27 mile bikepath from downtown Sacramento to Folsom. The water was calm and a slight cool breeze refreshed us. Then the climbing began when we turned onto Green Valley Road; we struggled as the temperatures rose on a roadway with no shade. We had a long lunch break at a cemetary at Bass Lake Road and Jack heartily enjoyed the deep shade and cool grass. We continued climbing and descending for most of the afternoon along the old Green Valley Road in the shade. However, at the end we had to walk up an incredible grade into Placerville. We headed into Placerville and came to a detour that was going in the wrong direction. A fellow cyclist came up to us and we flagged him down and asked for directions around the detour. 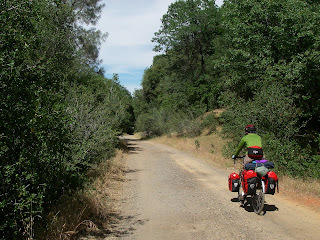 He told us to descend to an old gravel roadbed which was the former railroad grade into Placerville. He said it was the shortest and easiest way to get to Main St. The railroad grade was wonderful and we got to town in short order. We're at 2000 ft. and climb to 3500 ft. tomorrow. High clouds signal cooler weather tomorrow. Onward we ride! Way to go Dave and Belinda. What a delight to share your trip--thanks so much for taking the time to write the blog and post the photos. Wishing you the best of luck--I can almost feel the long, hard miles, and taste the refreshing cold beer at the end of the day! p.s. I'll do the WOD in your honor tomorrow. My legs started aching while reading about the grade into Placerville...compounded by heat that must have been a challenge. I've been wondering...how has Dave been getting his Starbucks fix every day? Are the chocolate covered espresso beans helping? I should have put a Starbucks giftcard in your survival pack! Hi all, sorry to be so late in getting back to you, but we've not had a signal for the past three days. We've had lots of adventures in those three days. They will be outlined in the post yet to be composed today. Mark, thanks. Knowing how hard you attack the WODs, I am humbled by your honor. Dianna, I want to thank you for your very thoughtful gift. Your selections were excellent, but we haven't had to resort to the chocolate covered coffee beans yet. So far I haven't been coffee deprived. Leslie, I thought of that too, but unfortunatly our route changed because the Mormon Trail was still closed due to snow. I would have enjoyed a swim at Sly Park Lake (which is now called Jenkins Resv).